I was hesitant to provide the copy links to these Google Drawings because it's important, to me, that people learn to make their own. This is not to be selfish. I'll give anyone almost anything. I just don't want to take away from the learning that happens when we make things. Sometimes learners, however, need drawing templates to avoid an unwanted cognitive load. Or not – kids of all ages surprise me. The goal is for learners to make it on their own or with very little help. Regardless of how much time is given to the student, using Google Drawing to make graphic organizers opens many doors to what's possible. Add images, links, and stuff I have yet to learn about. This kind of work will not end in the wastebasket. The following examples focus on a variety of subject area possibilities. The templates are a nice start, but even the description (in red) encourages individual interpretation. Click or touch each image for a copy link. Don't underestimate the power of a simple T-chart to organize the before and after. With GAFE, you can add pics of the experimental / control conditions before and after. Add notes to bring the results into context and add links to research to complete a great beginning to an interactive lab report. These were never my favorite to show similarities and differences because it's hard predetermine how much writing space you'll need. This is not a problem with Drawings. Focusing your writing is a hard skill that everyone needs to practice. The inverted triangle can be used a couple different ways. The first way would be to use it like a news report structure with the most crucial details earlier in the story, making it easy to chop the bottom to accommodate space on the newspaper. Another way is to use the graphic organizer to list the most general details while moving down to the more particular. This is another skill that everyone needs to practice. Learners could label parts of a cell, explain a picture of a medieval manor, make maps with links to other resources, or label the math of building a house, to name a handful. You're probably thinking desks, right? How about seating the characters of a novel for a special dinner event. Learners could add blurbs about each character and summarize the kinds of convos that may transpire throughout the meal. The network tree can be used to classify species, show military or political office leadership, or to show how a story unfolds. Try using the network tree as a concept map. For example, the vowel concept can be followed by the vowels, which can be followed by words with those vowels. This kind of mapping helps with writing organization and other skills needed for planning and semantic work, like writing code and making software. This problem-solution graphic organizer should look different almost every time. For more complicated problems, choose different shapes and arrows to best visually represent the main issues and the potential path(s) to solution. Likewise, the solution may be a cloud like shown below or something else that depicts a bit of the essence of the solution or problem solving process. Reflecting on knowledge, making predictions, and reflecting on learning are three key exercises that make any lesson more powerful. K-W-L is a great way to organize these thought processes. This is perhaps one of the most useful problem solving strategies because it allows learners to consider more than one option and work with those options in different ways. The purpose of a timeline is to see when things happen in relation to one another. They are crucial for history courses, and can be just as important for ELA, math, or science. The nice thing about using Drawing to make timelines is the freedom to try different orientations, add images, link resources to text boxes, and add color to enhance the analytical points learners may need to make. Most of this can be done with paper, but not as easily. If you have any ideas about how Drawing can be used in other ways, subject-specific or not, please share in the comments below. Are you finding a top essay writing reviews site? No problem, huge essay writer’s site has online. You can justify and take help from best site. I love Google and their products. I just created my logo use Google. 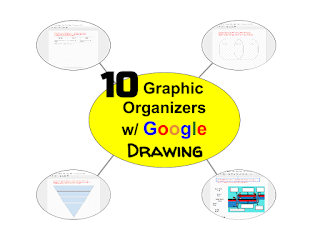 10 Graphic Organizers With Google Drawing is the good opportunity for the students who have craze of graphics. Google is offering great platform to learn about the Graphics and these organizers invest a lot with Google. Any way, I want essay reviews online grader but this website is one of the best site to getting information about study.